The UK is set to get an actual digital cloud in time for the Olympics which will house "a barometer of the city's interests and moods". The idea has been proposed by researchers at MIT, after a competition was announced to build a new tourist attraction in London for the 2012 Olympics. 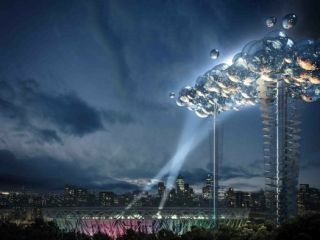 The structure dubbed as "the cloud" would consist of two 400-foot towers and a number of interconnected bubbles, which would include things like an observation deck and a series of digital displays relaying statistical information from the Olympics. If MIT win the competition, then the 'mood barometer' aspect of the cloud would be powered by Google. Interestingly, the whole structure would be powered by solar energy and paid for by the public – in the form of micropayments. "Everyone around the world can contribute to the Cloud - whether by visiting or by sponsoring an LED, helping to keep the London lamp aflame," says the blurb on the website www.raisethecloud.org. Even if MIT fail in their bid to win the competition, it sounds like the researchers will still build the structure. Whether it will be made in London is not known. The cloud has already got London Mayor Boris Johnson's seal of approval. he is quoted as saying it is remarkable. To be fair, he probably says that everyday when he sits down at the desk marked 'Mayor'.